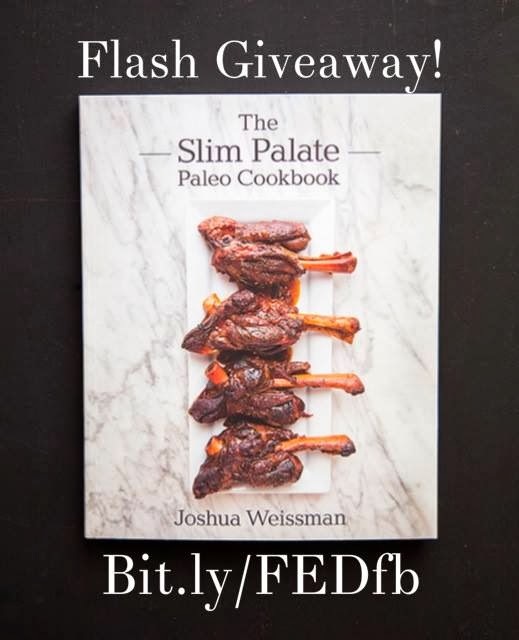 The Slim Palate Paleo Cookbook comes out tomorrow and to celebrate, I'm giving one lucky person a free copy of this beautiful book! - Leave a comment in the original FB post letting me know that you've done the steps above. I'll choose the winner tomorrow (3/11/14) at 1pm EST. The winner must respond within 24 hours or another winner will be selected. Due to Amazon restrictions, this giveaway limited to those living in the continental US. Good luck! Teenage foodie Joshua Weissman lost over 100 pounds just by turning from trendy diets to real food. Now he shares how he developed a sensible, yet still indulgent, philosophy of eating for health and happiness, along with some of his favorite recipes. For decades, the food industry has misconstrued valid viewpoints about healthful ways of eating, sometimes leading the public even further from good health. For this and many other reasons, we have become increasingly disconnected from the food we eat. In The Slim Palate Paleo Cookbook, teenage food blogger Joshua Weissman, who lost more than 100 pounds by eating real food, shares some of his favorite recipes, along with his philosophy on food. This book focuses on the use of whole foods and on eating for happiness and health. Whether you’re trying to lose weight, you want to be healthier, or you just love food, The Slim Palate Paleo Cookbook brings it all to the table with more than 100 recipes that will appeal to inexperienced and advanced home cooks alike. The Slim Palate Paleo Cookbook includes recipes that everyone can enjoy making and eating that are free of grain, gluten, and refined sugar—ingredients that are all too common in our Western diet but can be real roadblocks on the path to wellness. Healthful food does not inherently taste bland or bad; Joshua proves just that with recipes such as an irresistible Rolled Pork Loin lined with fresh and fragrant herbs, a hearty Shepherd’s Pie topped with a creamy cauliflower mash, and a flavorful Steak and Brussels Sprouts Stir-Fry. Vegetable dishes such as Braised Leeks and Artichoke Hearts and Grilled Eggplant and Tomato Stacks will show you new ways to cook and enjoy your favorite veggies, and maybe even find a new favorite.